College of Science and Technology, Nihon University. The goal of the Graduate School is to develop talented chemical engineering technicians and researchers, who possess both creativity and the ability to research the development of cutting edge technology in the diversified, highly developed field of chemical engineering. At the School, students are attached to labs where they receive individual instruction from professors, and conduct a high level of research in line with themes set by the labs. Because the field of research covers diverse content, from nanotechnology to life sciences, there is a wide range of options. Further, a high degree of know-how can be acquired across a wide spectrum because there are several class subjects related to various fields. Depending on the kind of special exercises conducted in affiliated research labs, it is fully possible to cultivate capabilities in specialized fields. 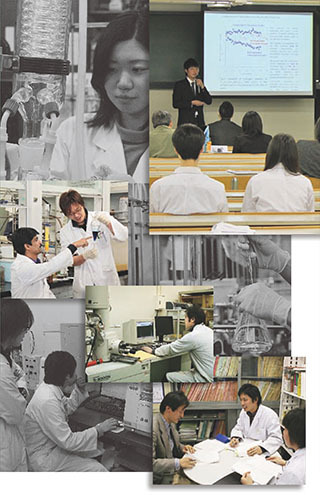 Research outcomes are announced at conferences and published in journals within Japan and also abroad, thus making major contributions to the advancement of chemical engineering. Copyright © College of Science and Technology, Nihon University. All rights Reserved.